Actually, first of all put the water on to boil. 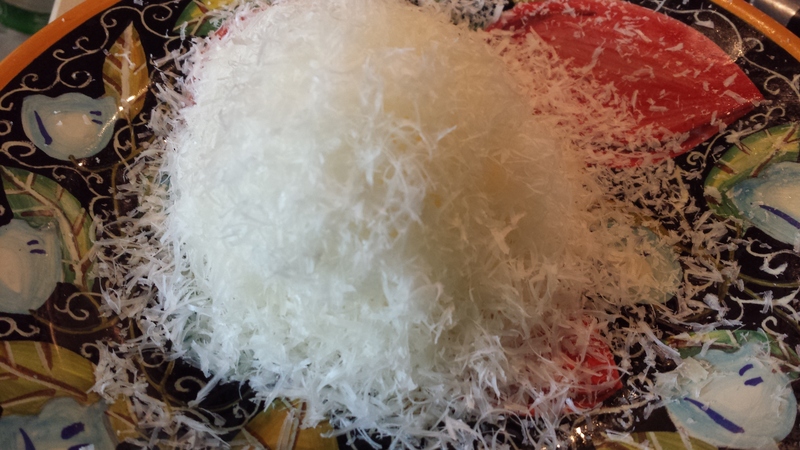 Then grate the pecorino romano cheese. I say ‘first of all’ because grating cheese is something I do not like doing, and so I either get somebody else to do it for me … or get it over and done with first myself so that I can breathe better. 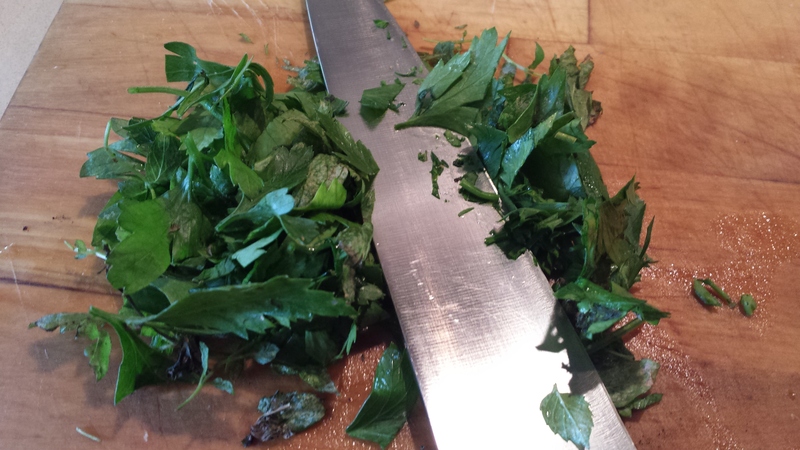 Chop a mixture of parsely and mint. Or parsely only. Or mint only. Whatever you prefer. I don’t think basil would work in this recipe, however. 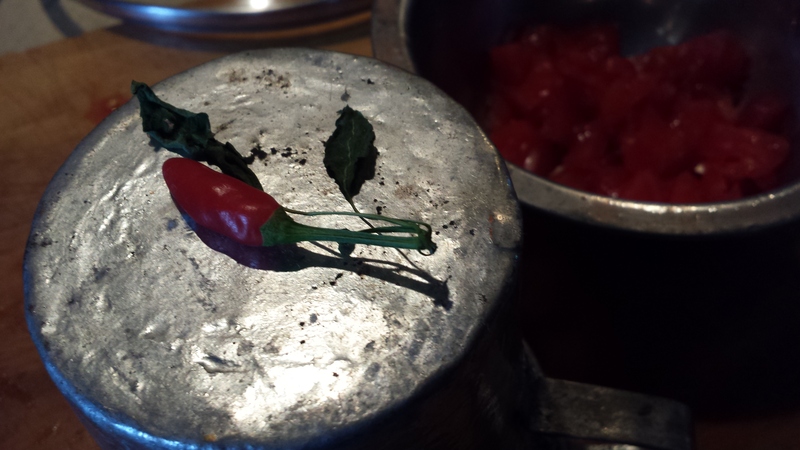 If you like heat, chop up some chilli or use chilli flakes. 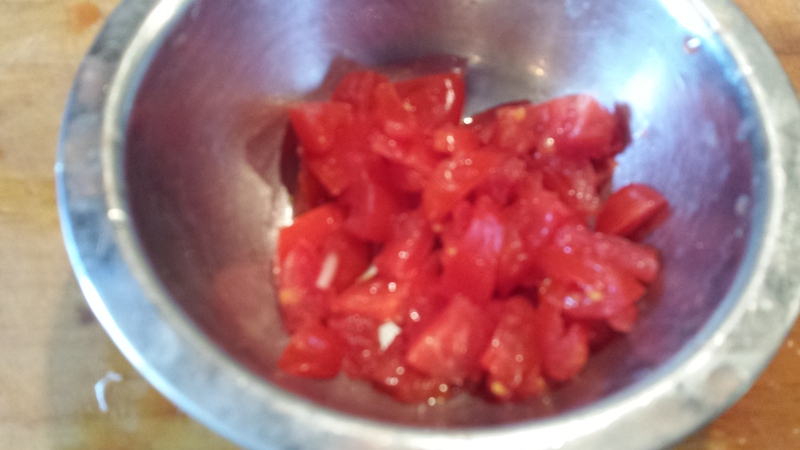 Chop up a couple of tomatoes and remove as much of the pulp and seeds as you are in the mood to do. 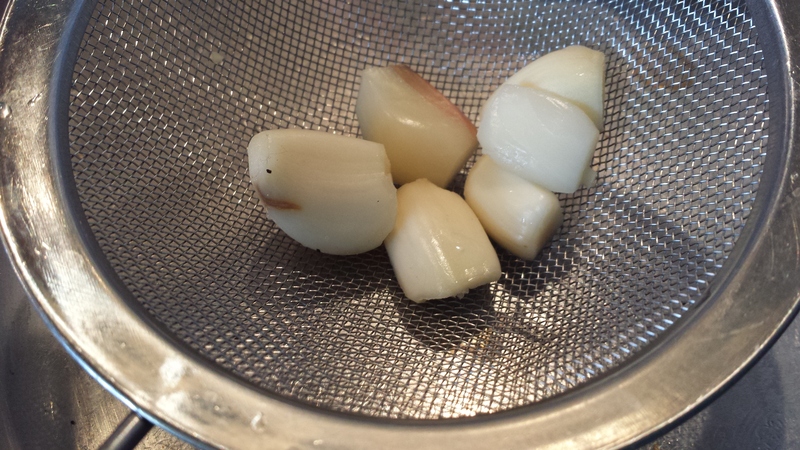 Place the cloves of garlic in cold water. One clove per 100g of spaghetti and one more for the pot, the way one puts in 1 spoonful of tea leaves per cup and one more for the teapot. Turn on the heat. 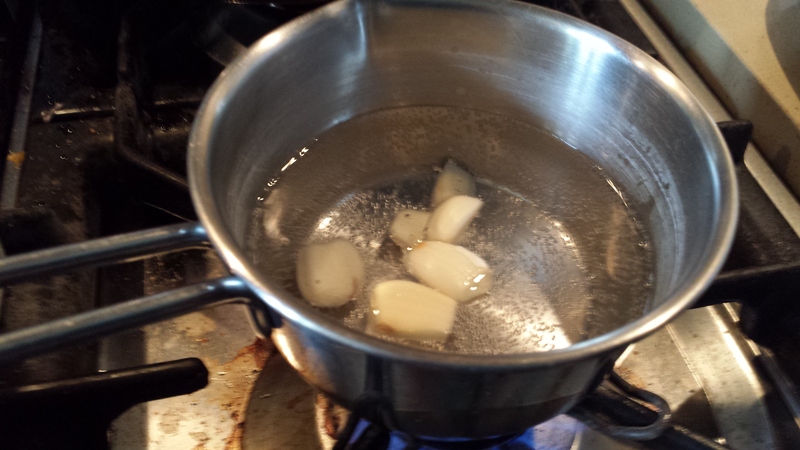 When tiny bubbles of simmer rise to the surface, immediately drain the garlic. 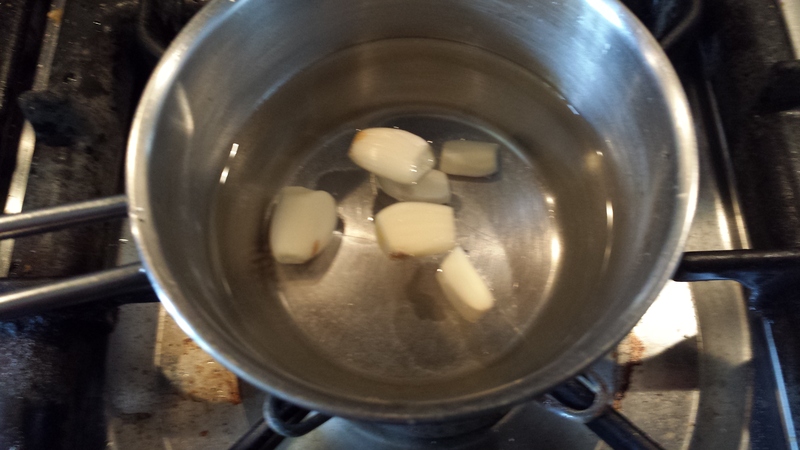 Put the garlic back in the pan, add water and repeat the procedure. Repeat the whole procedure once more. 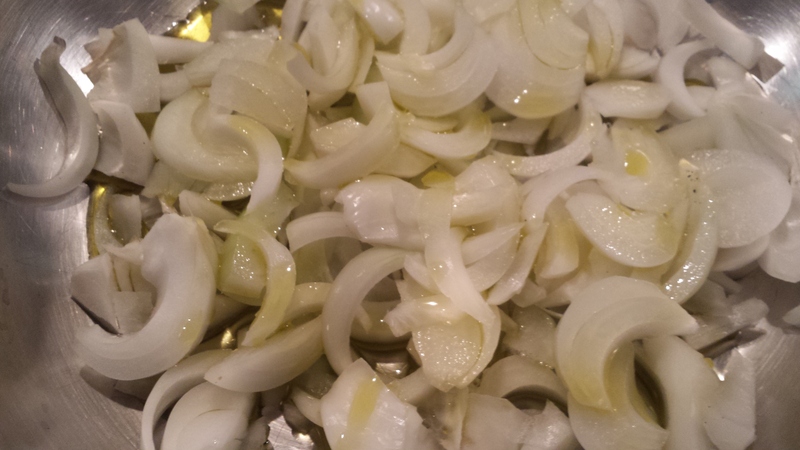 Then slice the garlic into fairly thin slithers. Thin slithers are required for this recipe. 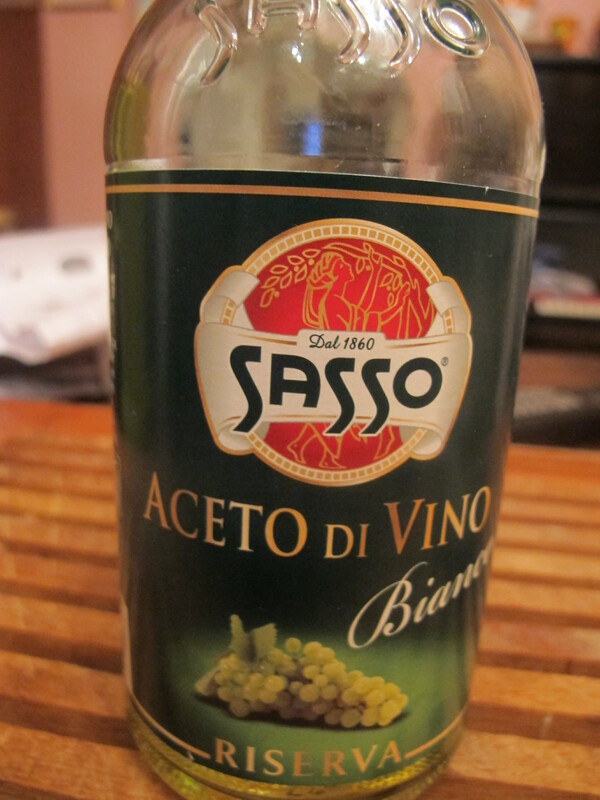 Pour the best quality olive oil you have into a saucepan. Add the garlic and only now turn on the heat. Low. Low heat. We want the oil to be infused with the flavour of the garlic. 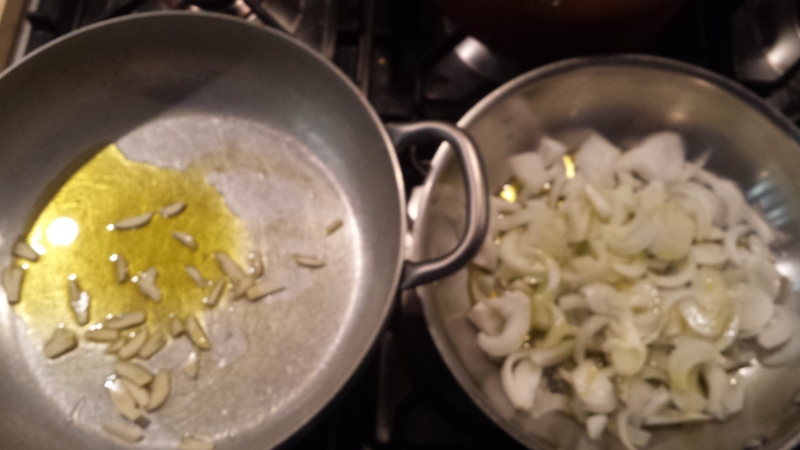 The longer the garlic takes to cook the better. Keep a beady eye on the saucepan at this point ! blink and you’ll have missed the second the garlic went from golden to burnt! And then it will be too late … and it will be a case of Oh Woe is Me! 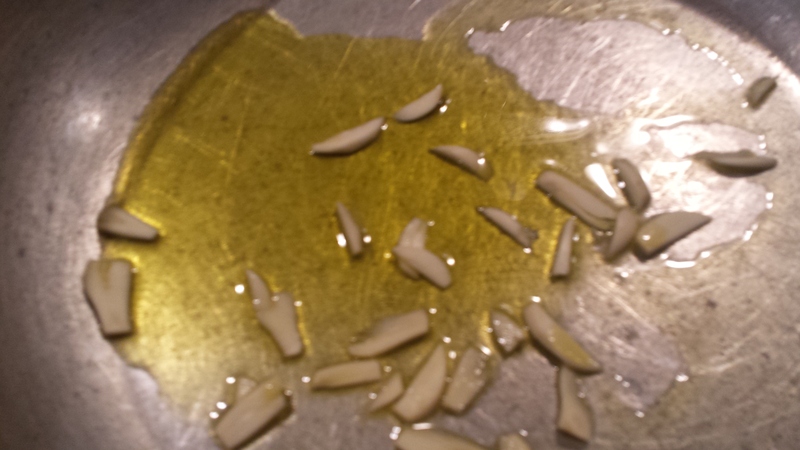 Garlic disaster. 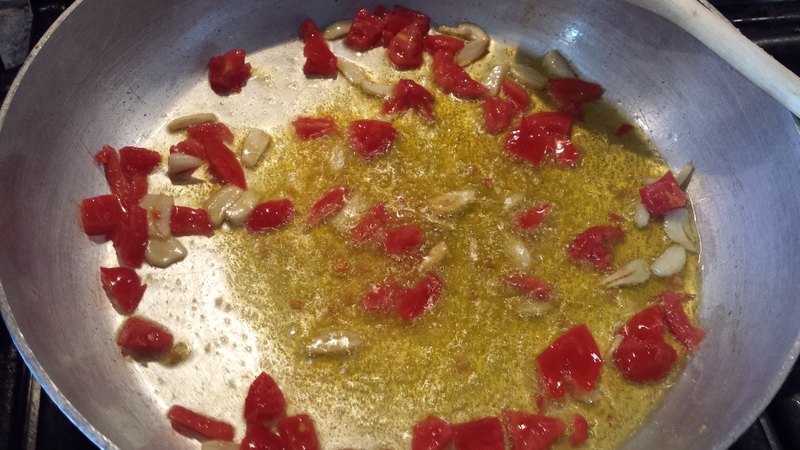 When the garlic has reached its golden colour stage, add the chopped tomatoes. 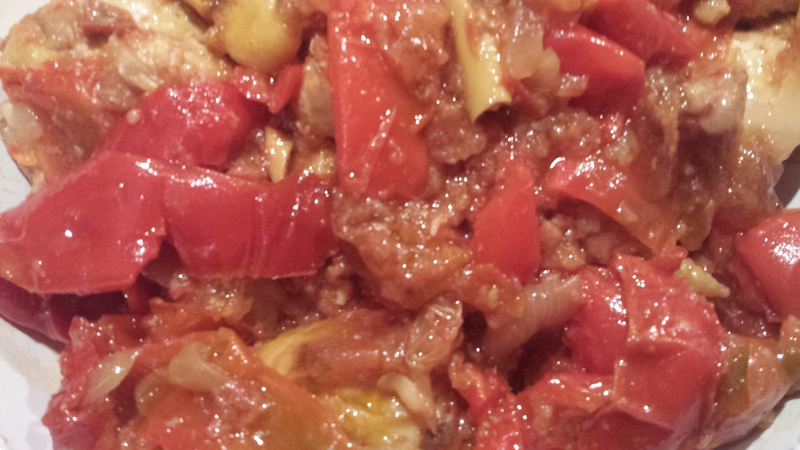 And the chilli too, if you like it. And now and only now can you turn the heat up a little, and get the tomatoes to cook. A couple of minutes will do it. 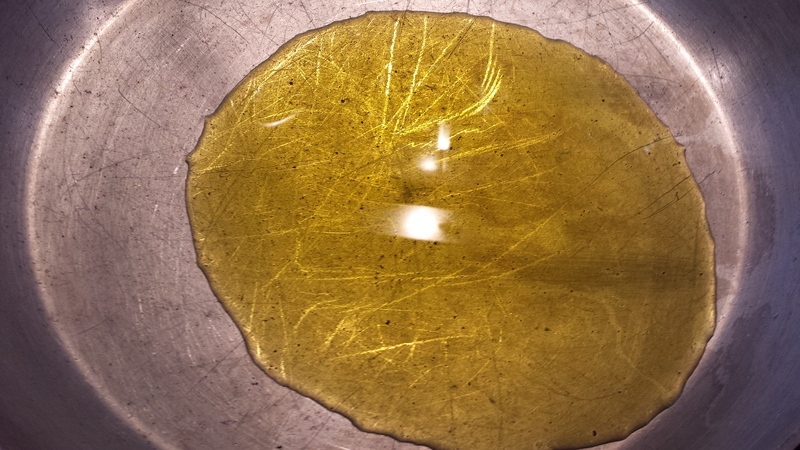 The sauce is ready. Switch off the heat. Taste and add some salt if necessary. 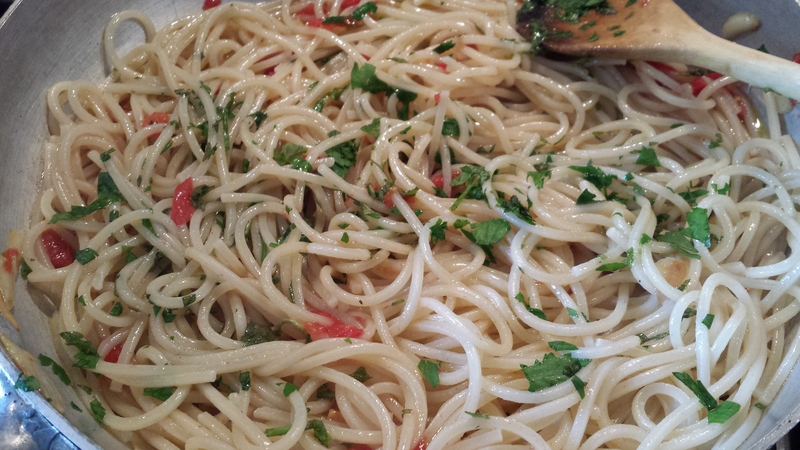 Drain the spaghetti directly into the sauce and the saucepan. Mix well so that the pasta is coated all over. Add the herbs last. Of course, if the idea of cooking is not an appealing one for you, the ‘easiest’ fallback recipe is when someone else cooks for you … but needs must on occasion that even the most reluctant cook has to rustle up something for the evening meal and I am sure that a recipe such as this one would offer a modicum of consolation. Another boon is that it is best eaten on the following day – at roome temperature at that, hence, drum roll, it can be prepared with utmost calm with music playing in the background and a steady heart beat. 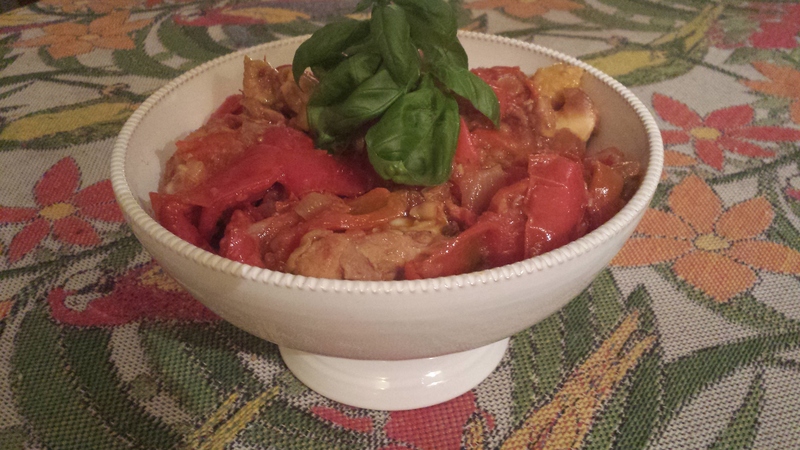 It is a typically Roman summer dish and reminds me, don’t ask me why, of the the dinner we had with my cousin Teresa the night before she delivered her baby boy. And yes, it was in July twenty plus years ago. 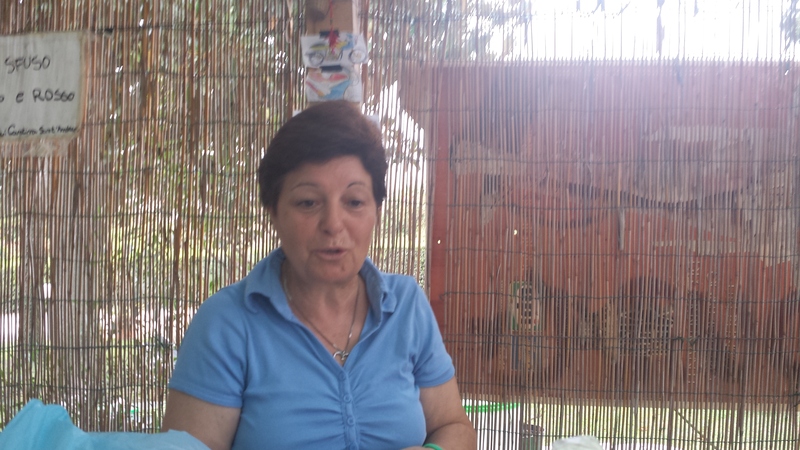 Her husband Mimmo is a retired cook and we spent a few weeks together in July this year near the seaside town of Sabaudia. Here they are, leaving the beach hut on the motocycle. 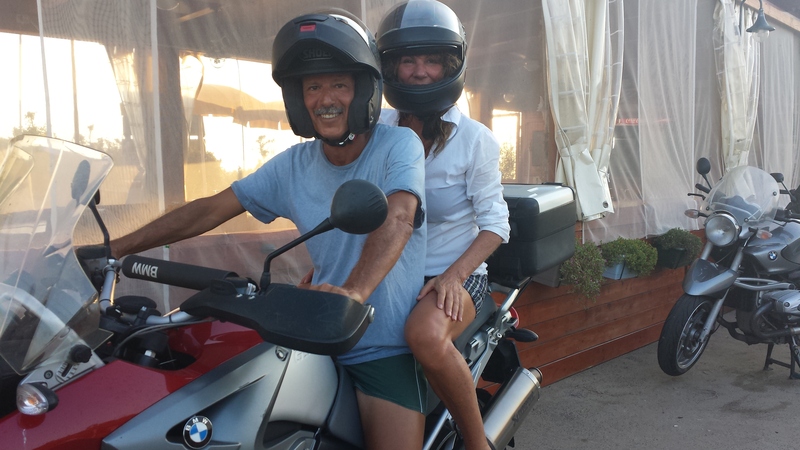 Teresa and Mimmo love their food and wine just as much as we do, and I have to say that I would never be able to spend too long a time with anyone who didn’t. 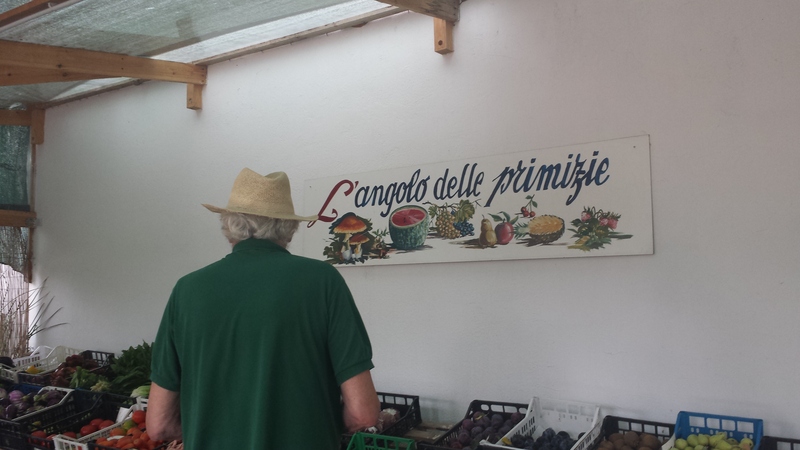 This said, Mimmo tends to go AWOL in the kitchen when on holiday and likes to cook as little as possible, and as simply as possible (although he did spend quite a few mornings making jam, using the delicious ripe fruit we found locally chez Luciana’s). 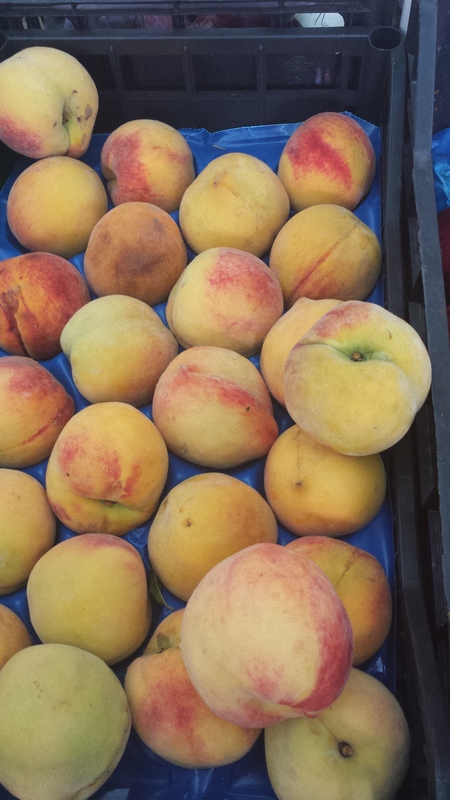 The other factor was that this, the summer of 2015, has been an infernally hot one, hot and sticky … and naturally perspiring over a hot stove wasn’t going to be too appealing for anyone. 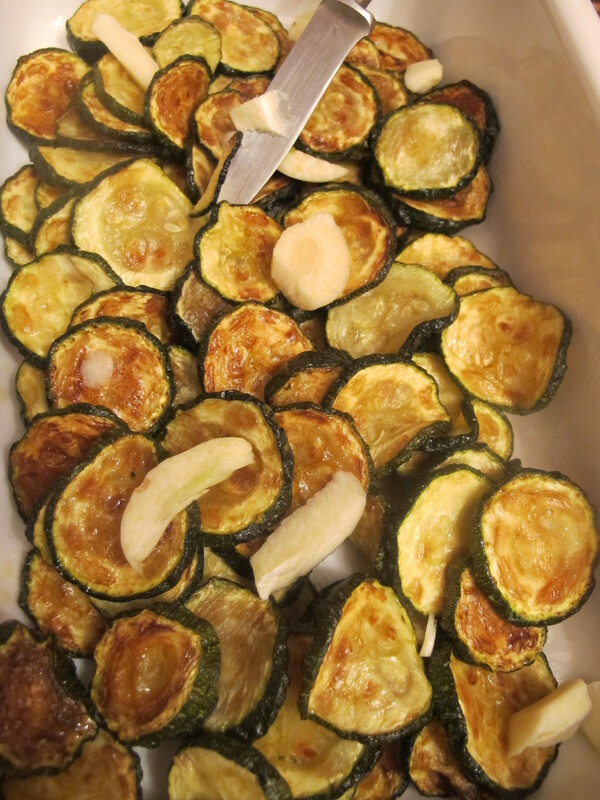 People thought I was mad when I insisted on frying fiori di zucca (mozzarella stuffed courgette/zucchini blossoms) but then, I am a fried-food-fanatic and they are such a crowd pleaser. For the rest, salads and charcuterie and mozzarella loomed large on our dinner table. 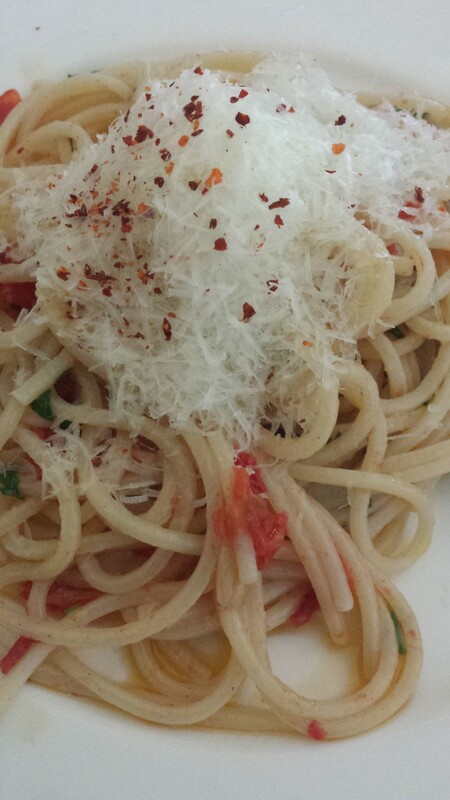 The only dish that was worth cooking on a daily basis was pasta – and yes, we are Italian and that’s what we do, eat pasta even when the temperatures soar. Anyway, I apologise for this detail in chronicling but the point I am about to make is an important one: Mimmo is a professional chef, number one, number two, he wanted to cook something most delicious with the minimum of fuss and effort. 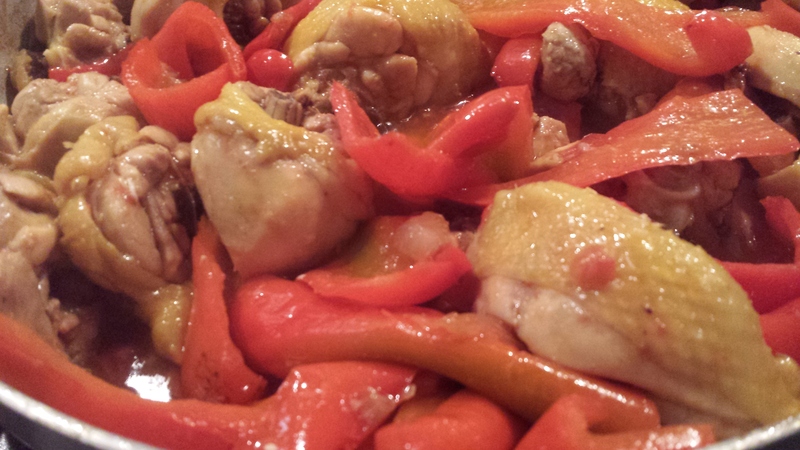 He made the pollo con peperoni for us one evening and it was delicious, really really delicious. So I asked him how he made it. And here is what I remember of what he told me. 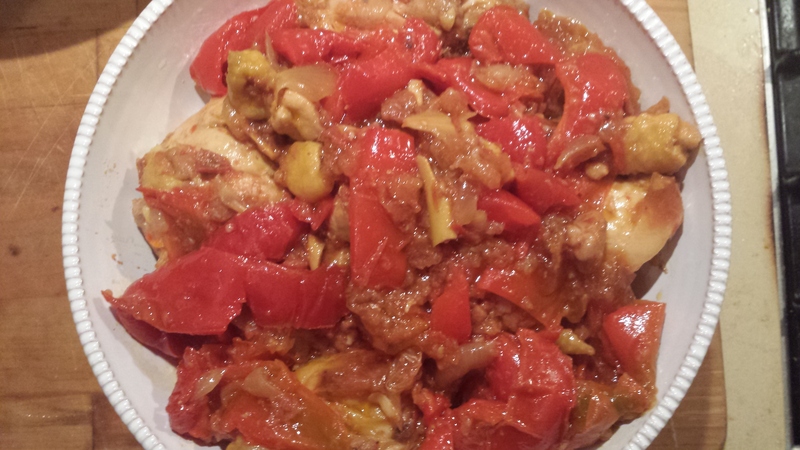 So i think we should call this Pollo con i Peperoni alla Mimmo. 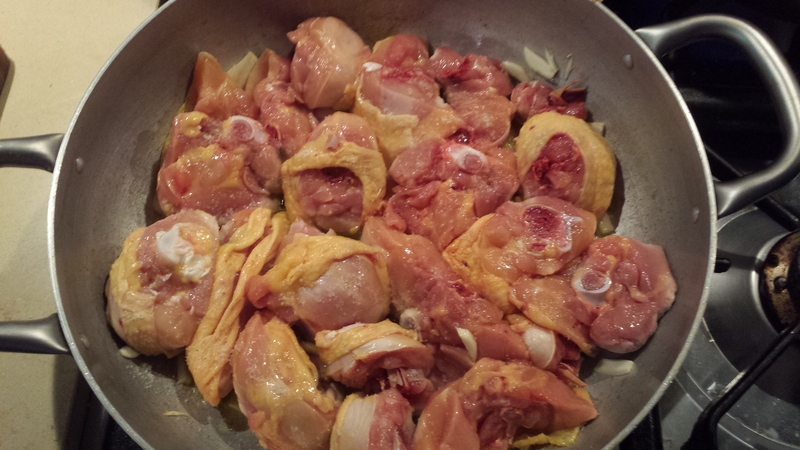 Here is chopped chicken, with the skin on. 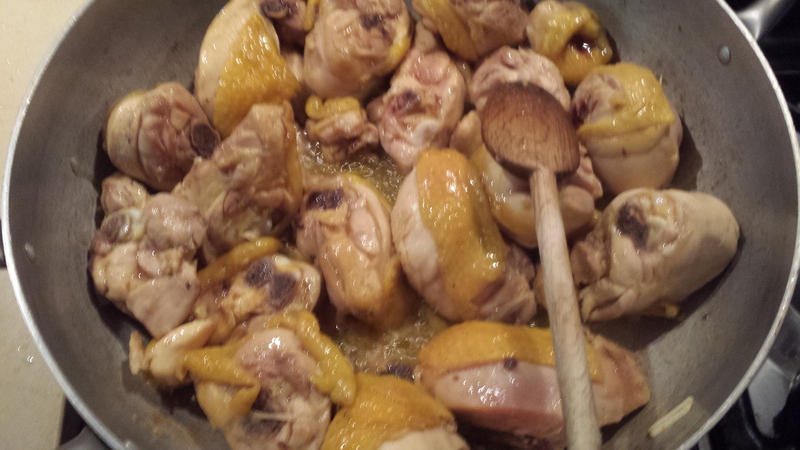 The chicken will cook in a saucepan/skillet with some evoo and some garlic cut into very thin slices. So thin that they will ‘melt’ into the sauce later on. 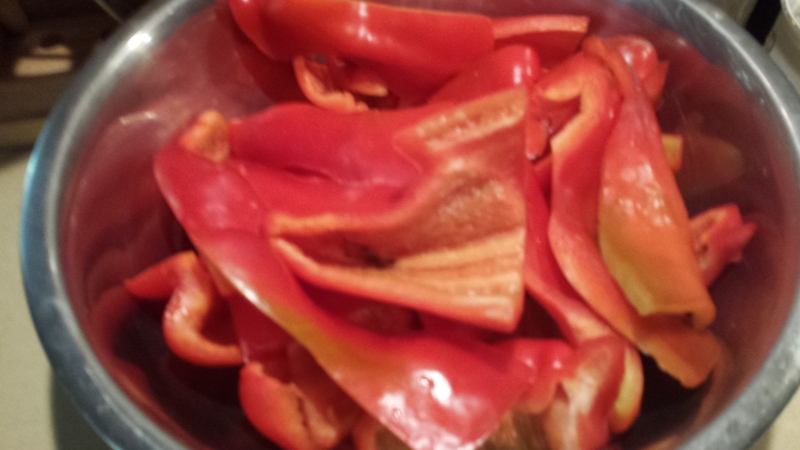 Here are some red peppers/capsicum that have been sliced and trimmed of any ‘white’ linings they might have had on the inside. 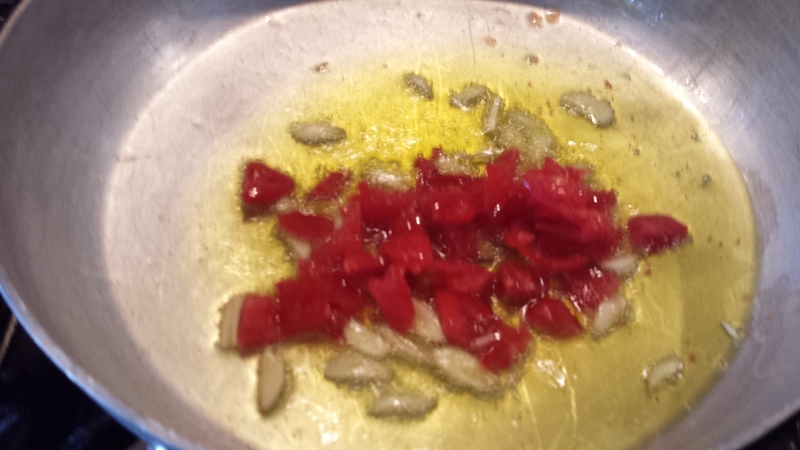 The red peppers are going to be stewed in a saucepan with some onion and some evoo. 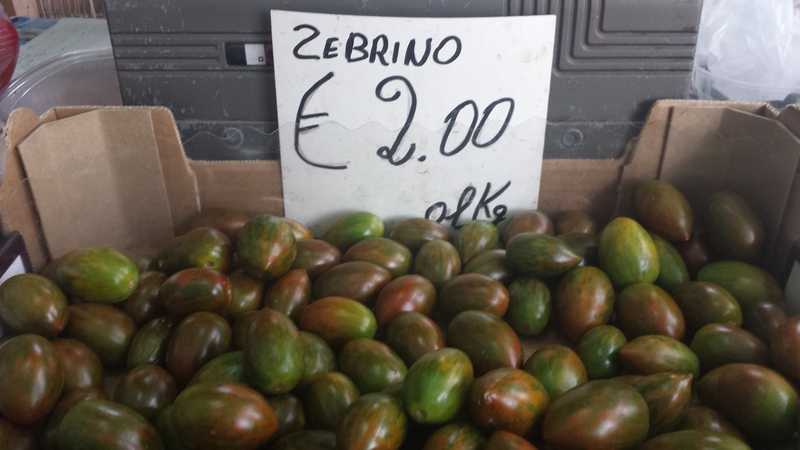 If you have red onion, even better. Sprinkle a little sugar over the onions. Can you see? 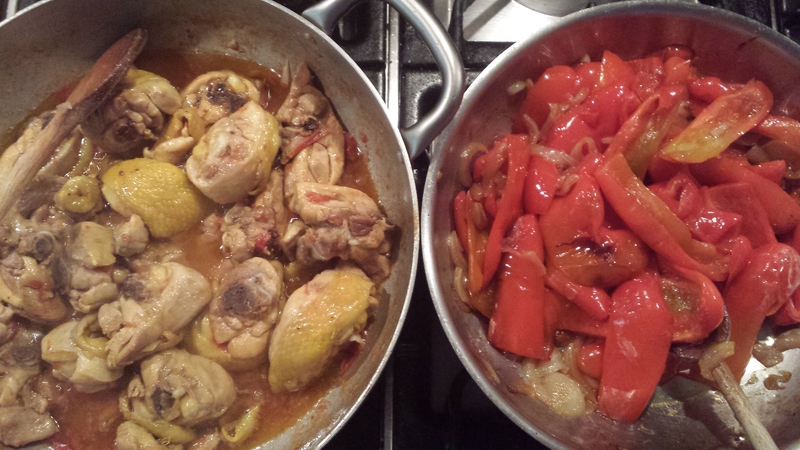 Two saucepans, one with garlic on the left for the chicken and one with onion on the right for the peppers. Turn the heat on. Turn the heat on. 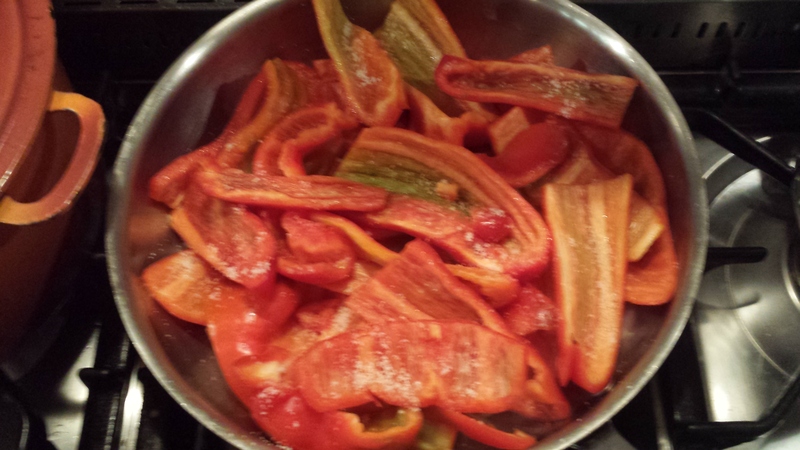 Sprinkle some salt over the peppers. 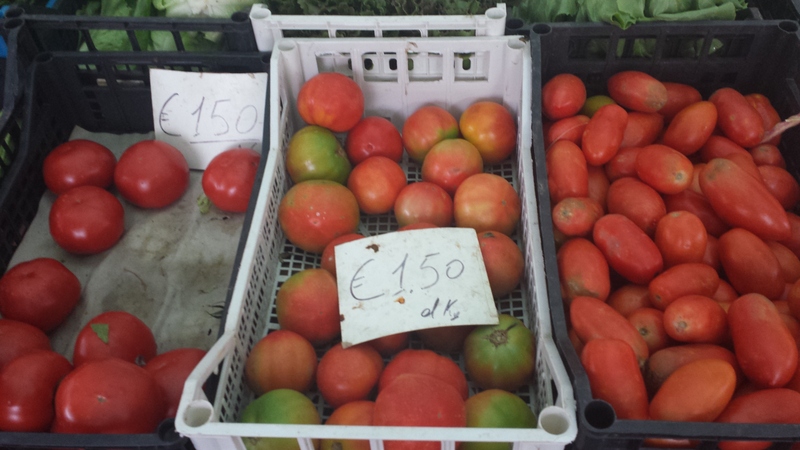 When the chicken has almost cooked, say about 20 minutes later (this will depend on how much chicken you are cooking at any one time) … Find the tastiest tomatoes you can get hold of and dice them up. 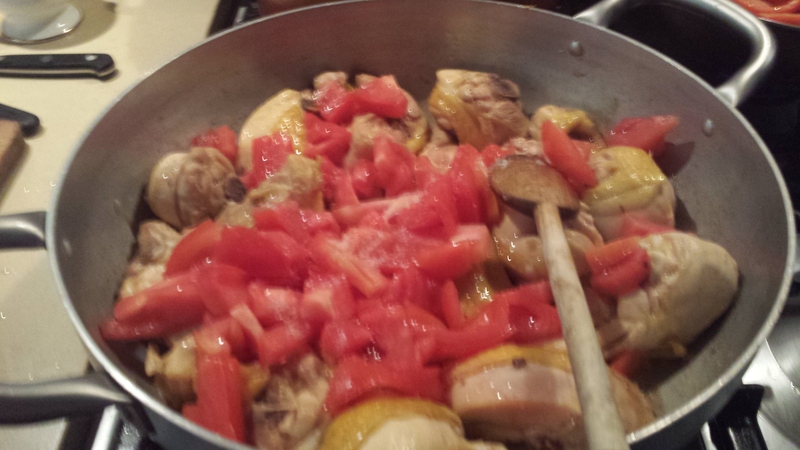 Add them to the chicken, sprinkle salt over the tomatoes, and carry on cooking until the tomatoes turn into a sauce. 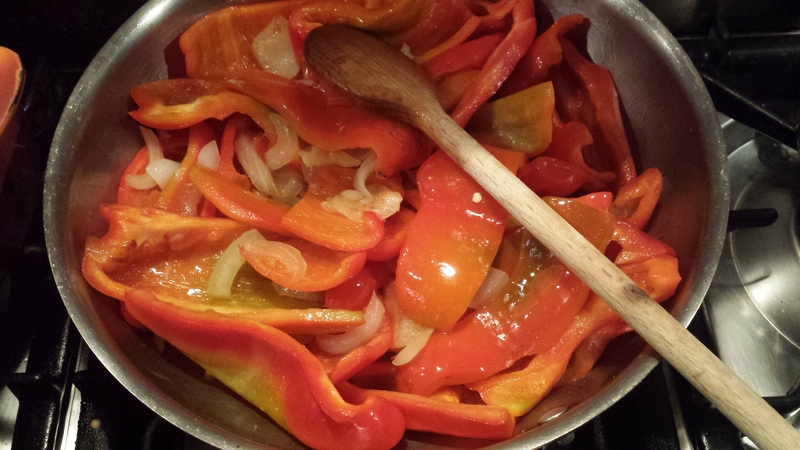 The peppers are cooked (almost tender). The chicken too has cooked. Now it’s time to put the two together. Cook them over a medium-high heat for about five minutes giving them a chance to really come together in gastronomic matrimony. 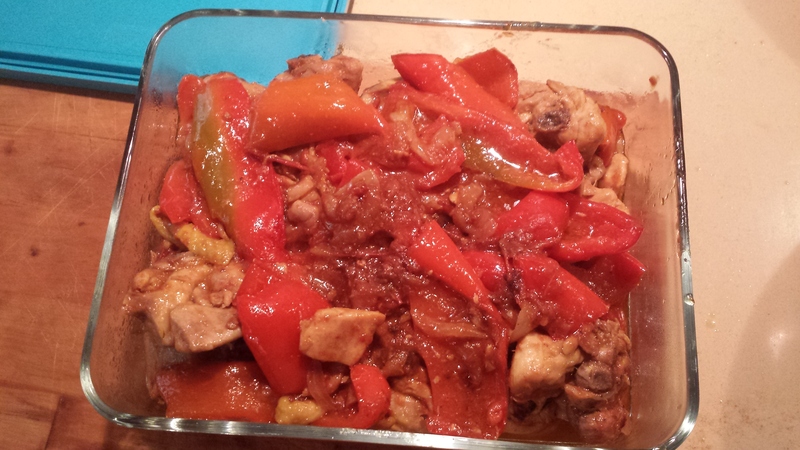 When the pollo con i peperoni has cooled down, you can transfer it to a glass container and stick it in the fridge, to be eaten the following day. Or even the same day, a few hours later on. Make sure, in either case, that the dish is served at room temperature. 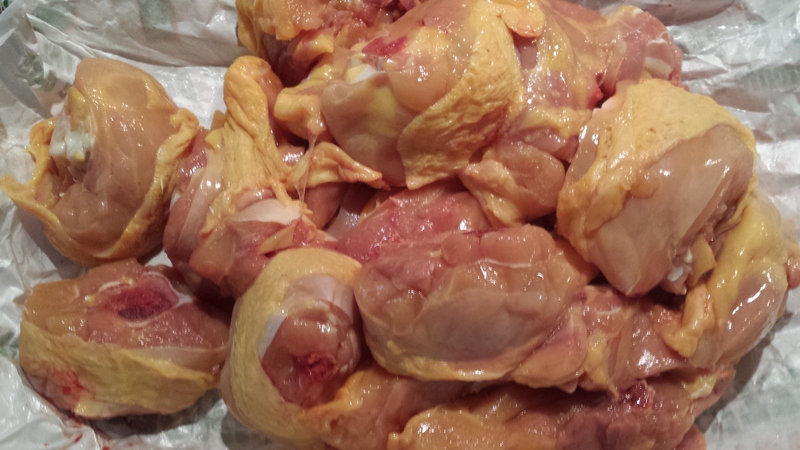 So remove from the fridge well ahead of the meal (2 hours at least). 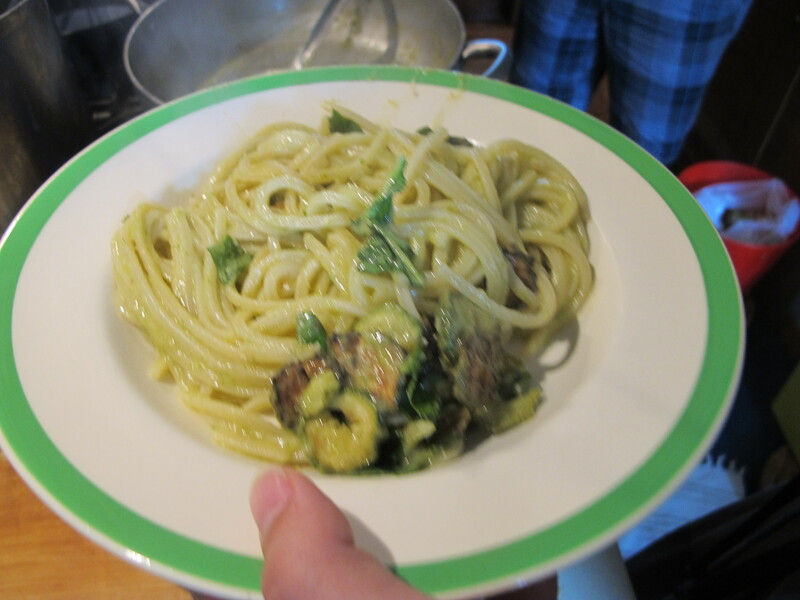 I stuck this huge sprig of basil in the middle of the dish and it looks silly …but it’s to give you the sense that you can add a little bit of basil, now, or even some finely chopped parsely. Also, it’s very important to have plenty of crusty bread to mop up the plate at the end. The sauce is very more-ish. 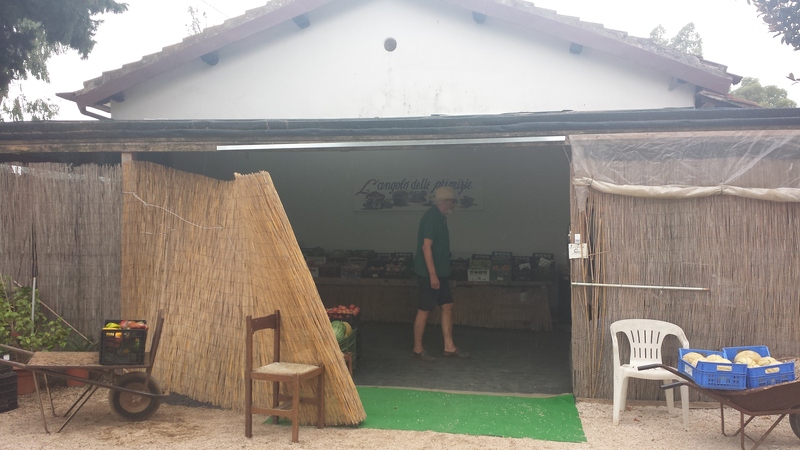 It was lovely for us to be able to get our fruit and veg from Luciana, whose farm is in Bella Farnia near Sabaudia and is open every day at all times of the day! This is a great recipe for those of us who like to rely on make-ahead meals on occasion – you know, cook the day before so that it’s ready the day after. 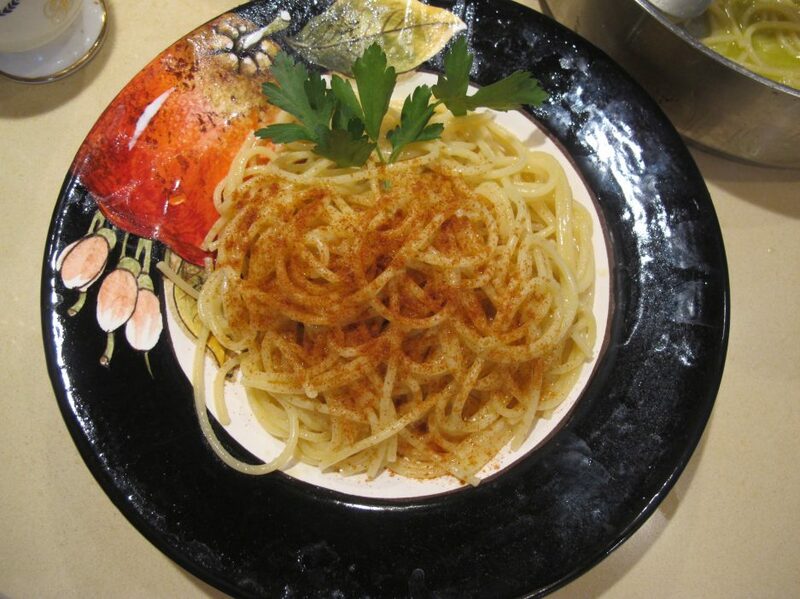 Indeed, since this is a traditional Roman Jewish dish, it was probably designed specifically for this reason, to avoid having to cook on the Sabbath. 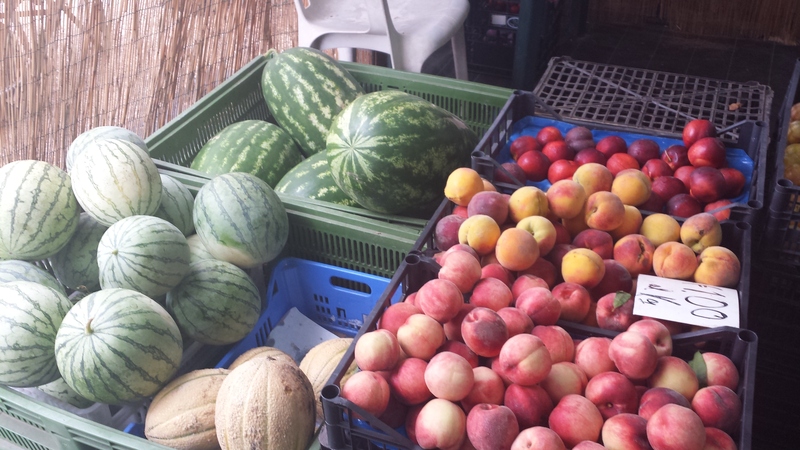 The Italian word ‘conciare’ itself means to treat a substance so that it will keep better and longer (i.e. 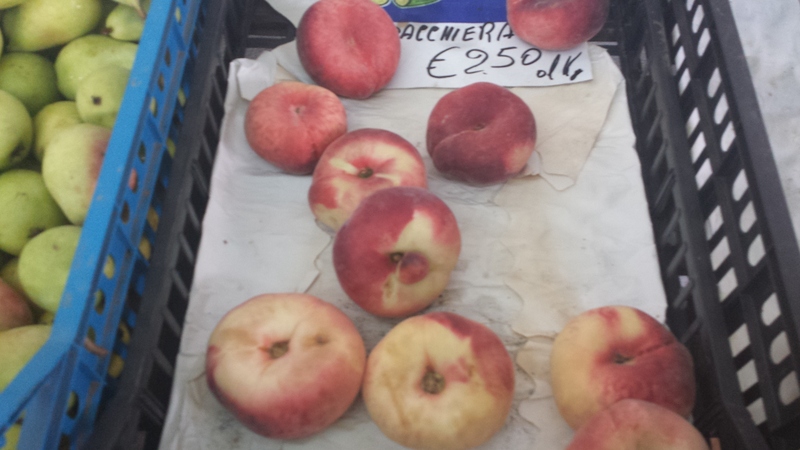 to preserve, to pickle or to tan a hide), and there is even a cheese called Conciato Romano. 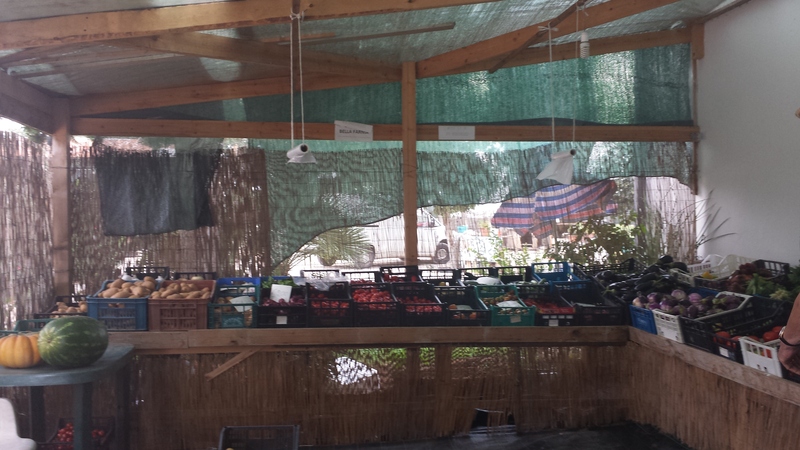 Thus I can only presume that ‘conciare’, when it comes to food, is basically about technique. 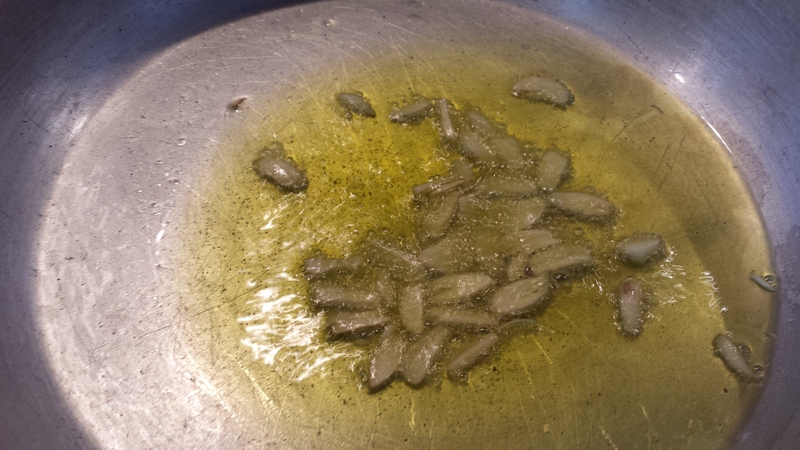 The technique in question calls for frying the food first and then adding vinegar to preserve it. In the days before refrigeration, salt and vinegar were vital for making food last longer. 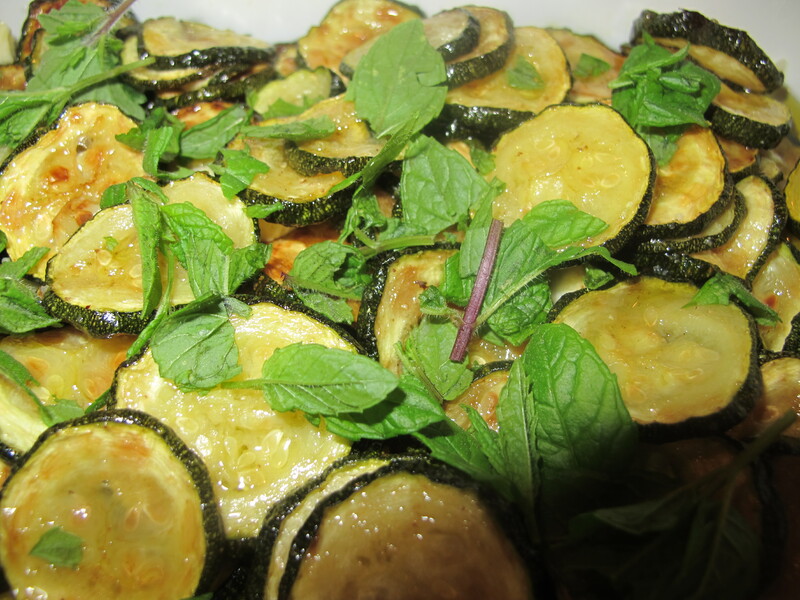 The ingredients are: courgettes/zucchine, olive oil, garlic, vinegar, salt and fresh mint leaves and/or parsely. After washing and trimming the courgette, cut it into fairly thick rounds. 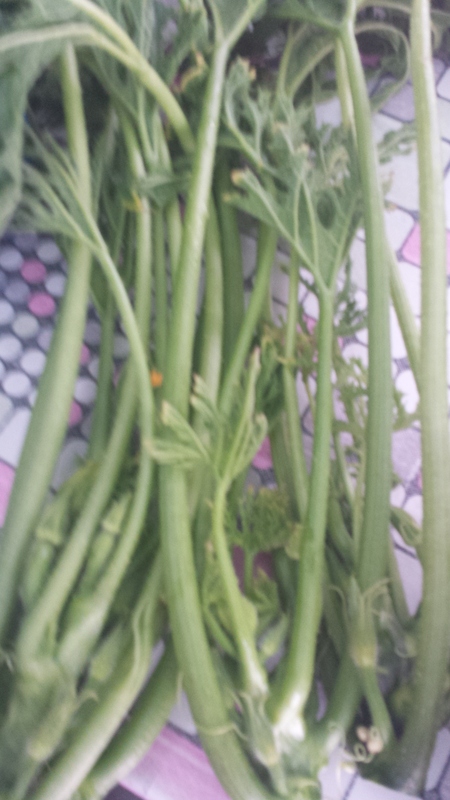 I have seen on other recipe blogs that the courgette can also be cut in lengths or diagonally even. You choose. 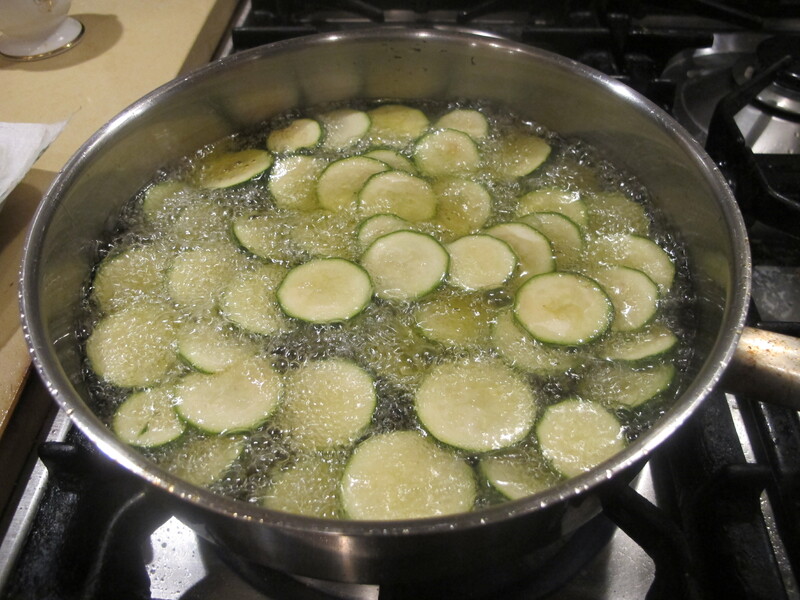 Some recipes call for salting the courgette for about an hour, so as to remove excess liquid. 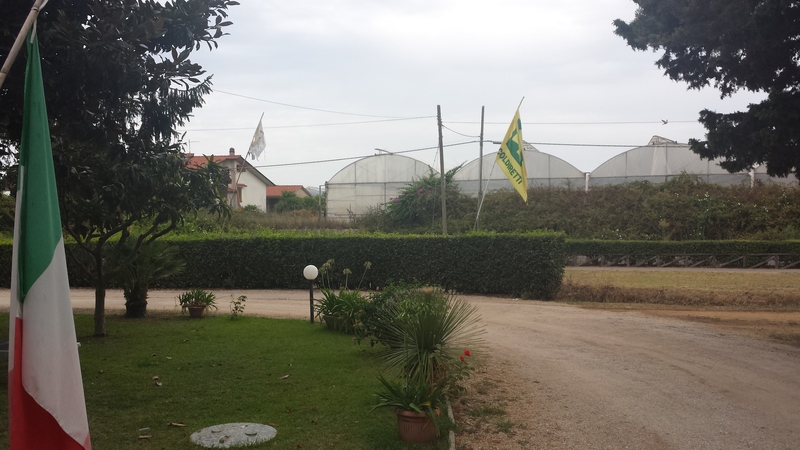 I didn’t bother but I did pat the courgettes dry. 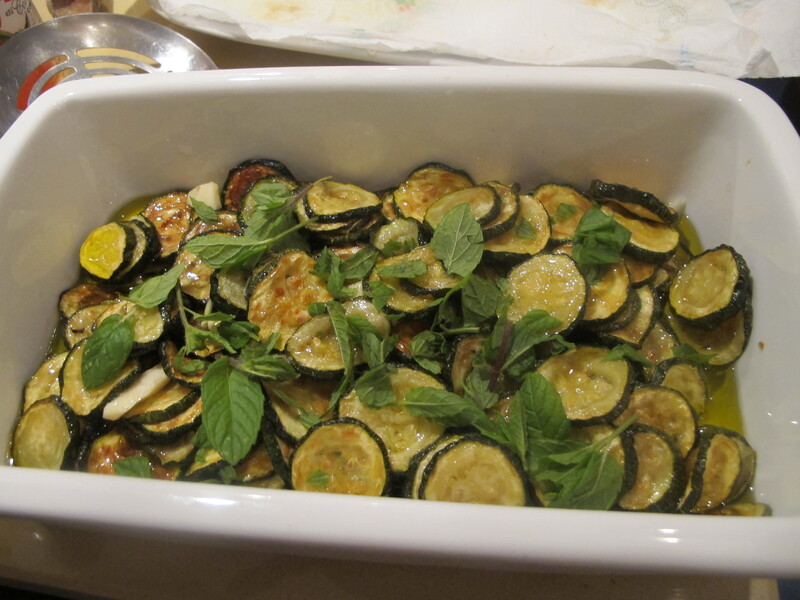 I insist that olive oil be used for shallow-frying this dish just as I insist that olive oil be used for frying aubergines/eggplants in order to make a parmigiana di melanzane. It makes all the difference, really it does. 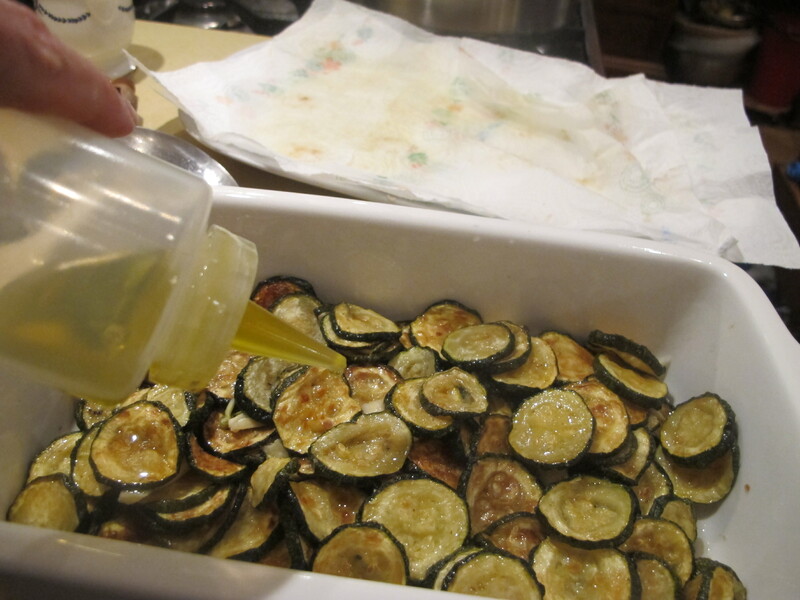 Also, make sure the level of the oil is at least 4 cm level deep and don’t be surprised to see the courgettes soaking a lot of it up ! 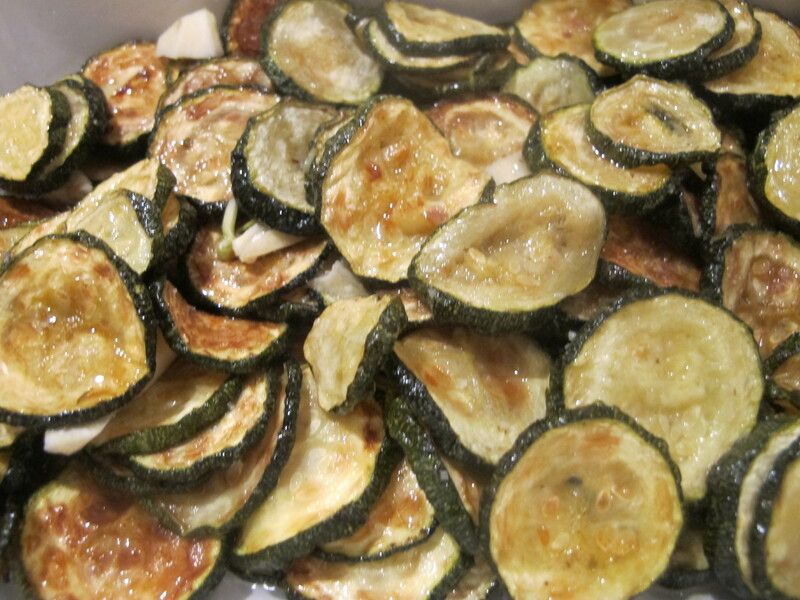 It is better to fry the courgettes in batches on a medium high heat. 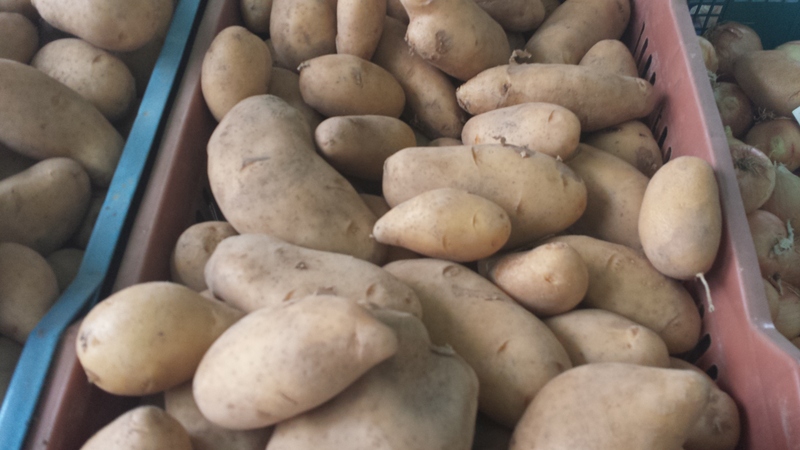 Fry until they turn goldeny-brown. 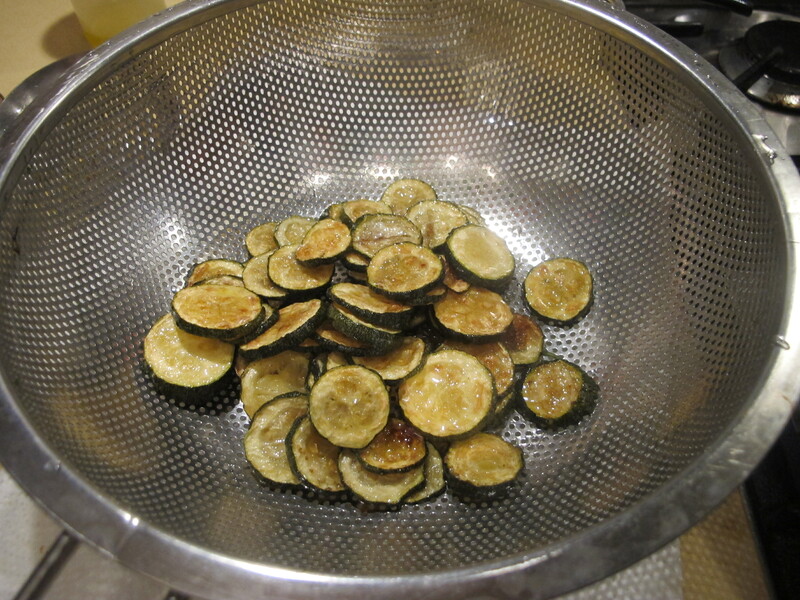 Drain the fried courgettes in a colander and then pat dry with kitchen paper. 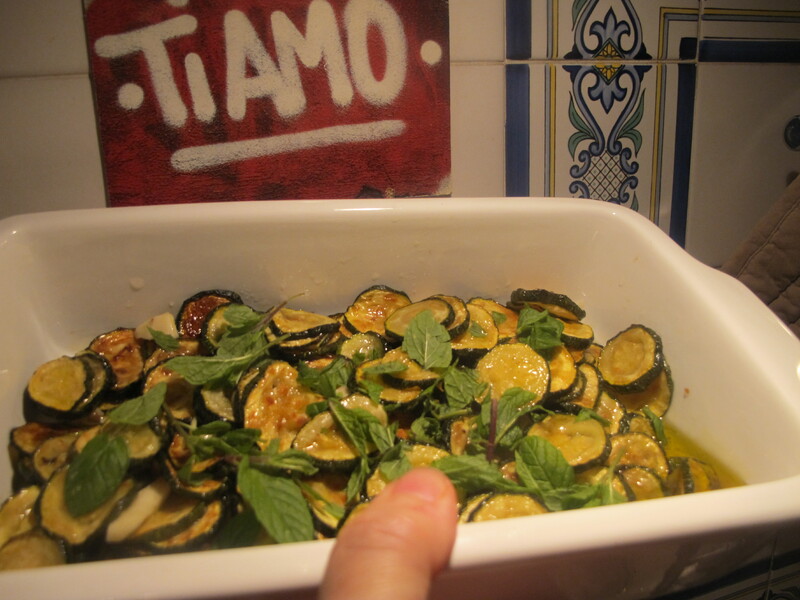 Place the courgettes in a deep serving dish or even in a glass jar. Now add some garlic … I like the cloves to be cut in half, so that they will, yes, do their job and season the vegetables but will also be large enough to be spotted and set aside if people would rather not ruin their palate with an onslaught of raw garlic. 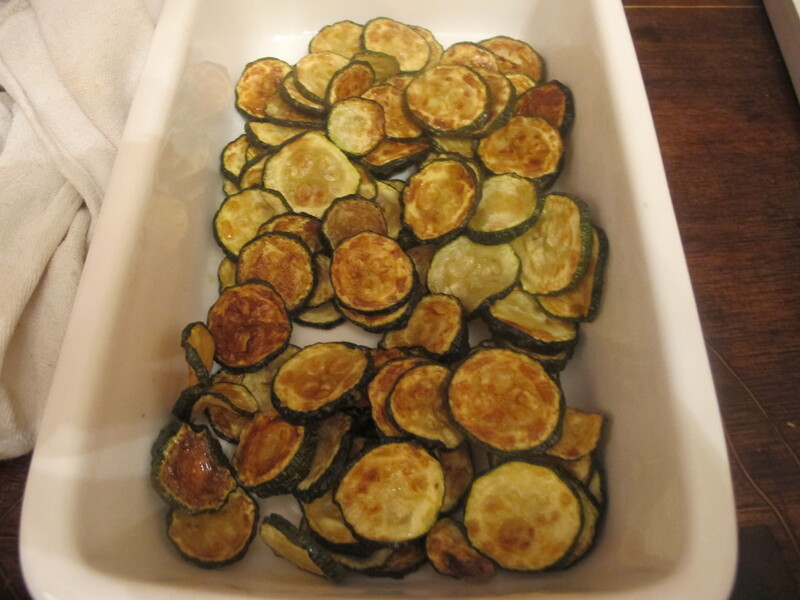 Once all the courgettes have been cooked and drained, it’s time to give them the vinegar treatment. 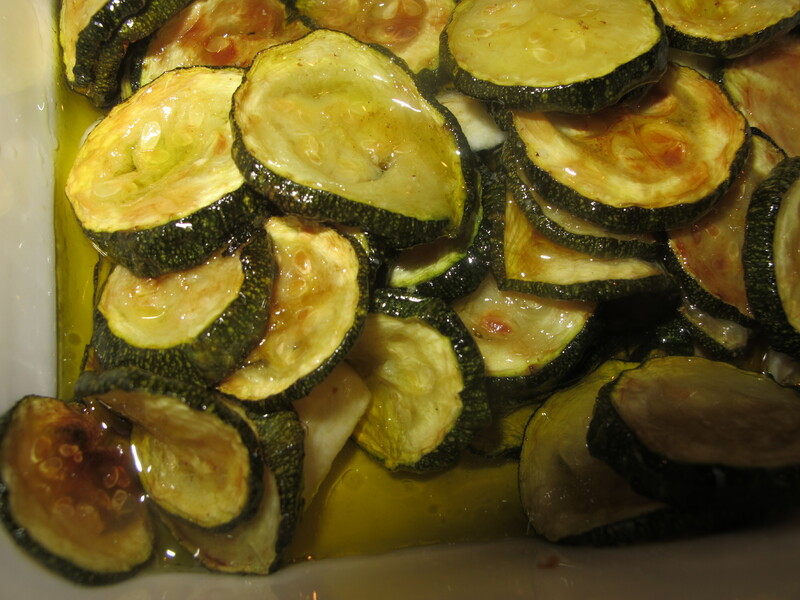 Use white wine vinegar … and don’t just drizzle it lightly over the courgettes, give them a good glug. 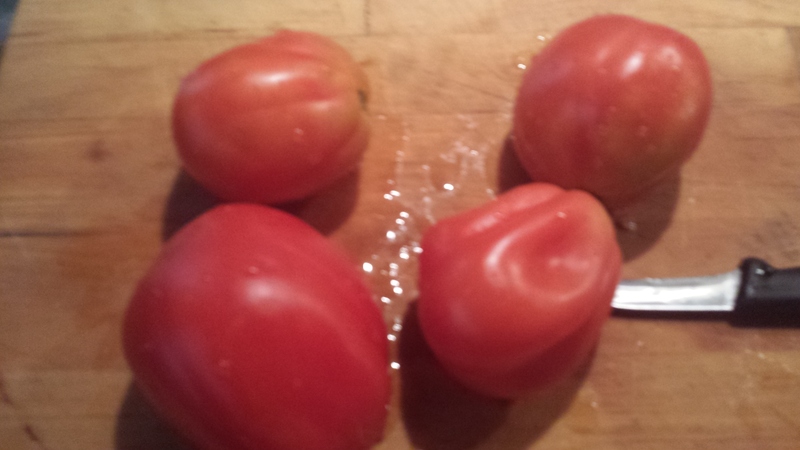 Be generous when sprinkling the salt too..
Time to add raw olive oil now. 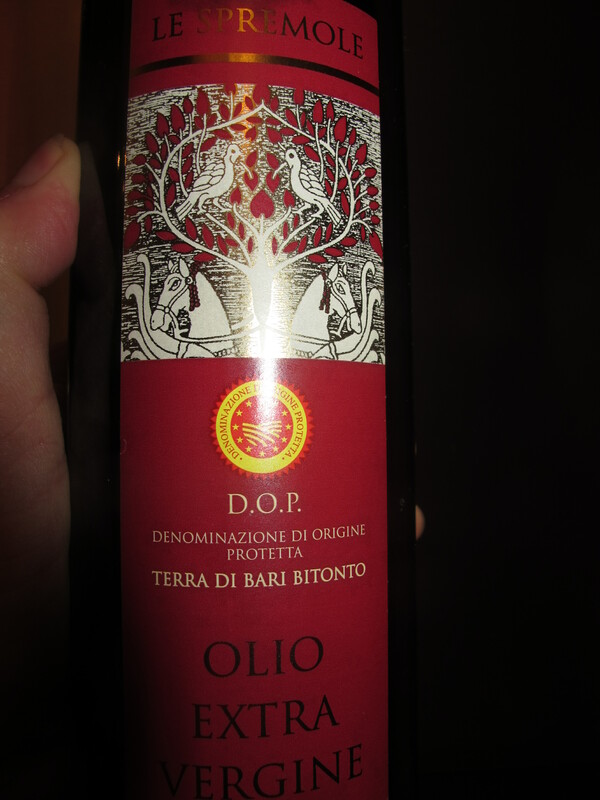 And no ifs or buts, ONLY olive oil. Taste and check whether more vinegar or more salt is needed. Use a spoon to mix everything together. Now, as a final touch, add some mint leaves. Or parsely. Or both. 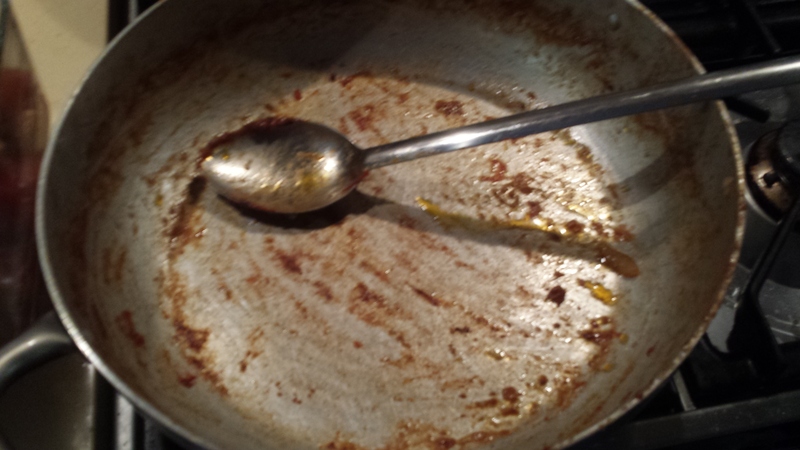 The thing to do now is cover the serving dish and set it aside for 24 hours. 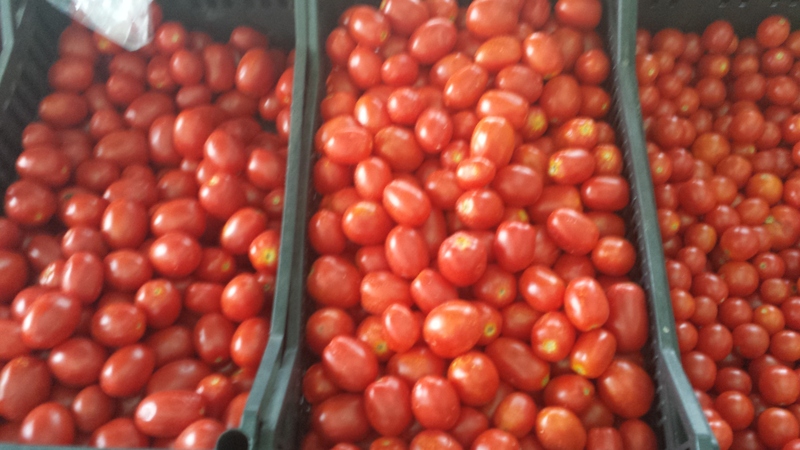 Serve the concia the nex day as a vegetable side dish, or as a starter with a selection of cheeses. Make sure the is plenty of bread to mop everything up.